More torque: In general, 4 stroke engines always make extra torque than 2 stroke engine at low RPM. More fuel efficiency: 4 stroke engines have greater fuel efficiency than 2 stroke ones because fuel is consumed once every 4 strokes. EPA Approved: As power is generated once every 4 strokes & also as no oil or lubricant is added to the fuel; 4 stroke engine produces less pollution. More durability: We all know that more the engine runs, quicker it wears out. 2 stroke engines are designed for high RPM. If an engine can go for 10000 rpm’s before it wears out; a 4 stroke engine with 100 rpm will run for 100 minutes than the other 2 stroke engine which has a higher rpm of 500 & will run for only 20 minutes. Starter Bike! Perfect for kids or youth to ride: you're better off going too small rather than too big if safety is your biggest concern. Front and Rear Disc brakes supply strong, reliable stopping power. 90/65-6.5 Front and 110/50-6.5 Rear tires offer great traction. 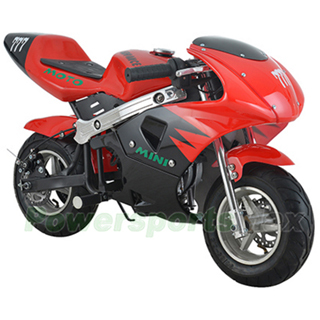 If you are in the market for a small, kid-friendly pocket bike then the 4-stroke pocket bikes are your best choice. The small 4-stroke pocket bikes are perfect for beginner use. However, it is also a fun bike for kids who already know how to ride and it would be a great foundation for a pit-racer or backyard-track bike. It is a TON of bike and performance for the dollar. Shipping charge for one single unit of DB-Z003 is $99.95(Please login to see real shipping charge for these states: Florida, New York, District of Columbia, Connecticut, Maine, Maryland, Massachusetts, Montana, New Hampshire, New Jersey, Pennsylvania, Rhode Island, Vermont, West Virginia, Delaware, etc.) , and you will get discounted shipping price if you order multiple item. 6-Coil Magneto Stator for 50cc 70cc 90cc 110cc 125cc ATVs & Go Karts (5-Pin),free shipping! Great pocket bike,girls loves it,loads of fun,came in 100% good working/looking condition,drives fast,25mph. A must get for the kids, will deffintly hey another or two on the future, cant wait for some to be old enough to have one,👌 great job dads!! Absolutely awesome lil bike!! Got it for my 5yr old to start and learn but its definitely fun for the whole family, rides GREAT!! This made my kids EXTREMELY happy for Christmas. We bought 1 blue and 1 red. Truly gas powered. Assembly was maybe 30 minutes. Started right up. Pretty fast too. Anyone looking for a bike for your son or daughter try power sports you cant bet the price and they are very professional. My son loves his bike. Im happy with it. Its his first bike we both cant wait for his next one. I just received the 40cc dirtbike right on time. It runs great. I bought it for my son and he loves it. Great bike. Great value. Very satisfied. My son loves this bike, it came on time its fast and sturdy ..